Hopping to contribute to the community and your opinions on the board and improvement opportunities! What do you guys think? I was looking at the table and it seems good! My board will be printed at 1,6mm! Do you think that this will be safe to use with the AC current? I have to insure that the traces will handle the max of the relay, this is 2A! I also raised the width of the pads on the Relays and connections to the relays to grant me a better connections! They are 3mm width! @soloam : I forgot that it's 2A! I was thinking about more amps and looking to your enlarged pads on bottom. So if you have checked, should be ok, cool. I'm not a big fan of radio too near of AC lines. seems you have nrf antenna just above Hilink main, hope for not too much EMI and decreased range, but maybe that will work well. I would have placed your fuses near AC connector. And for instance, to have most of AC part on one side, and other DC and radio on opposite side when possible. Easy to say! @Soloam - Great project, nice! Im also learning so im no expert but i though about the trace going from "AC 220 In"
@scalz has seperated the AC (below) and DC side. I have a question! On the AC 220 Input I have a trace going to the HLK and then to the varistor! I think ther's no problem doing this, but I would like your opinion! A question, any one knows how to add a Creepage on the KiCad? I looked and can't seem to find it! Does anyone have any relevant documents for these relays (G3MB-202P), the only datasheet i can find does not provide the typical current draw to activate them.... I would like to clarify that these are safe to run for the atmega328p pin output current max, allowing for spikes for any reason what so ever. Having a SMT MCU break is not fun to replace. Yes this is the datasheet that I have and used to draw the holes to the relay! Thank you for the replay @Samuel235 ! Can any one else confirm this to me? A question! I what to add a ATSHA204A to my board to authentication, but I have a question! Some people use a 0.1uF capacitor and a pull up resistor! Others don't use it! Can any one tell me the reason for that? @sundberg84 and @scalz what do you think of the layout now, with AC and DC separated? When I have all my question answered I can finally order the PCB and test it out! @TD22057, unfortunately that is the datasheet that i also have for it where there is no current information for the switching. I might power mine through NPN Transistors just to be safe for long timer usage. antenna still above circuit but I guess you want to keep the size. perhaps I would have reduced a little bit trace at AC screwterminals but if you say you have the right creepage, seems ok then. For pullup on atsha, maybe not really mandatory, I already tried without one, but it's always better to be sure to have the right voltage level. And always better to have it on CS SPI bus pin too. So, if you can add footprint for CS radio pin, it's better too. 0.1u capa is for decoupling/filtering/good voltage. Same thing here, it's a better practice to have it for each ic. I always try to add a bit more footprints when possible, so I solder what I need. Then if I have trouble I can easily add a component. But it's not always easy as I try to keep things small. Hello @scalz ! I'll try the RF in this position! My idea is to put the PCB in wall, and the radio will be facing to the outside, so my hopes are that it will be clear to the signal! I will try to add the capa and the resistor to the ATSHA204A, but the board is almost full traces! I have a question! On the AC 220 Input I have a trace going to the HLK and then to the varistor! I think there's no problem doing this, but I would like your opinion! Can any one confirme 100% that this will not be harmful? This is the only topic missing to make my order! A ended up changing a bit the layout to ensure that the current flows in the correct order! That way I'm 100% certain that it's the way to go! End Layout updated! I added a ATSHA204A to the board and revised the clearance on the AC side! The Varistor was reallocated to ensure the "correct" (don't know if it was incorrect in the first place) connection of traces! I'll make my order today, it will take something like 15 days to arrive after shipping! 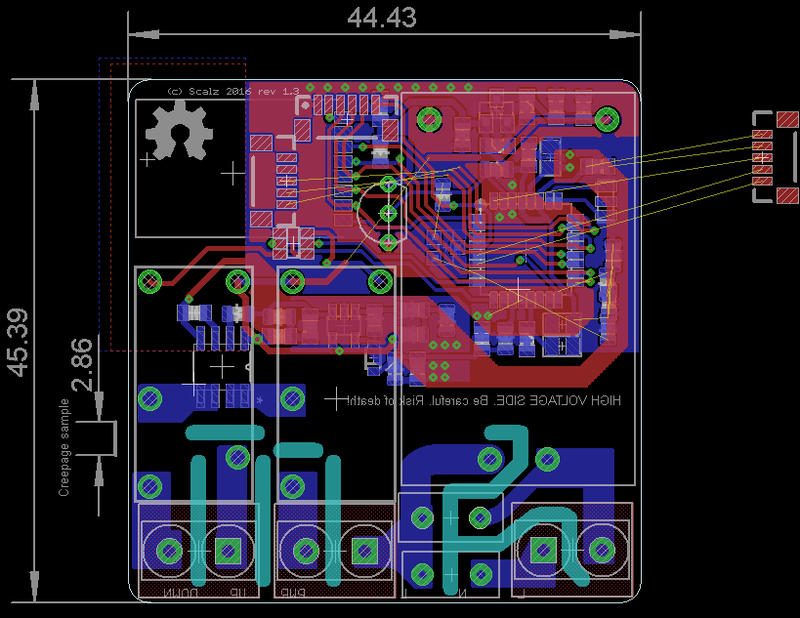 I'll test the PCB and if all is ok I'll publish the files for printing! I must say that I'm not a expert (very very far from that), so if you plan to print and use this board, do it at your own risk! AC current is dangerous! Thank you all for the ideas and tips! @Soloam, could you inform me of your clearance value between AC traces please? I see the trace width in your product description but i'd like to know the spacing you have used. Thank you. nice projet. I am very interested in it. But why you are using 5 V and not 3.3 V? The ATmea328 works with 3.3 V too and the NRF have to use 3.3 V.
The only restriction on 3.3 V is the clock limitation for the Atmega (8 MHz). But with no crystal it don't care. For example you could use an HLK-PM03 instead of HLK-PM01 and remove the linear voltage regulator. So you get more space an everything have the same voltage level. And another point is, it is recommended to use a capacitor (0.1 µF) to ground for each voltage pin (Vcc, Avcc, Aref).